Mount Druitt Hospital Volunteer Patient Transport Service driver Robert Blackwood and volunteer Patricia Moir and patient Catherine Baker. Mount Druitt Hospital Volunteer Transport drivers have been delivering people from their homes to their medical appointments since 1984. The friendly volunteer driving force has transported more than 75,000 people during this period. Blacktown and Mount Druitt hospitals’ voluntary services manager Janice Low says the team is looking for new drivers who are confident and friendly. “The buses seat up to 10 people and are automatic – so no special licence is required,” Ms Low said. “The teams work in a roster system, starting at 5.30am weekdays and we run four buses throughout the day. 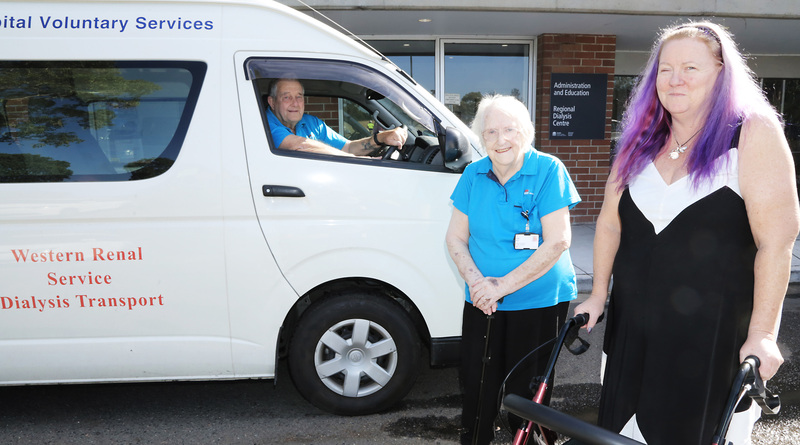 Hebersham resident Catherine Baker has used the volunteer transport service for more than three years to travel to and from her medical appointments at Mount Druitt, Blacktown and Westmead. “I rely on the drivers to take me to my appointments as I live alone and have no-one to drive me,” Ms Baker said. “I have a couple of health issues which require regular visits and medical care. “I don’t have a licence and need to visit my specialists and have appointments sometimes between three to five times a week. “I’ve never missed an appointment because I couldn’t find transport. I make sure I book my transport a month in advance which coincides with my medical appointments. The volunteer transport service operates between 5.30am – 3pm Monday – Friday. For bookings for eligible patients call 9881 1536. What are we doing to close the gap? 07 Mar, 2018, 9:09 am Leanne Findlay Comments Off on What are we doing to close the gap?